From An investigation into the viability of Building Materials Reuse Centres – MSC by Andrew Edwards, Oxford Brookes University. As the above quote notes the building sector single-handedly creates the largest amount of waste in the country. While figures vary in different countries, these sorts of numbers are not exceptional. In terms of carbon the industry accounts for about 10% of the UK’s total CO2 emissions. The potential to reuse materials in multiple ways is however beginning to be acknowledged and there are a variety of approaches across the mainstream of the industry as well as its forward looking edges, which look as if they are beginning to be taken more seriously. Building Materials Reuse Centres (BMRC’s) are a North American import. The centres aim is to reduce the environmental impact of buildings by reusing materials and building products. When buildings are renovated, rebuilt or demolished the place to take the now redundant materials are BMRC’s, so they can continue to be reused rather than head for the tip. Reuse is the other end for materials of a journey that begins with extraction or the first processes of being turned into products/buildings.They continue and extend the lives of these materials and products a number of times. The Centres (BMRC’s) come in various shapes and sizes but the core idea is common to all, a central hub for building materials, which can be re-used in other buildings. The community version is more established than exemplars for the construction industry; there is indeed much to be learnt from what examples are in place across the community sector in various different countries. Beyond the simple adaptation of the second hand store, there is the potential of developing integrated networks, which could refine the ecology of building material needs. Even if well developed in the imagination of some BMRC’s theorists, this doesn’t appear to be quite beginning as yet. Follow these links for examples of Building Materials Reuse and Building Materials Reuse Centres. 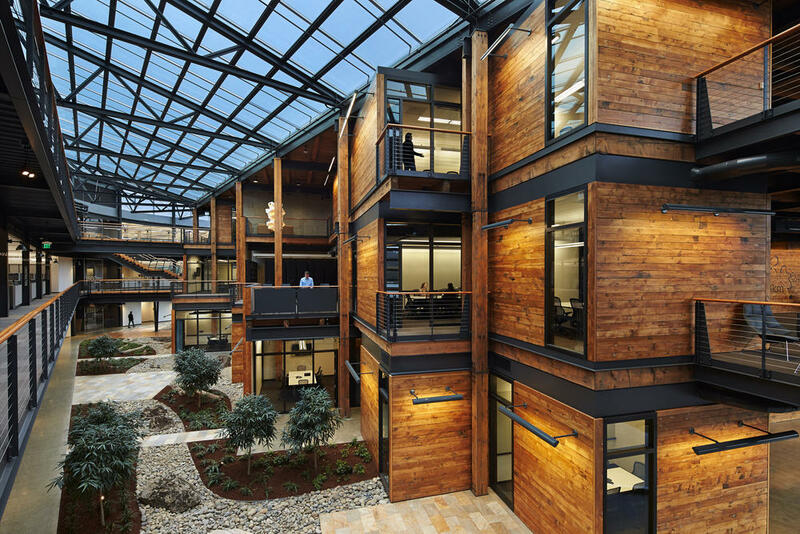 Bang up to date, the 2013 US green buildings awards included the Federal Center South Building 1202 which re-claimed remarkably around 200,000 feet of structural timber and 100,000 feet of decking from the decommissioned non-historic WWII warehouse on the site. According to the green awards citation, the team used “a phased demolition process, wood components were individually harvested from the warehouse. The team pulled nails, unfastened bolts, removed brackets and devices, trimmed out fractures, and sorted the wood before it was shipped to a local mill for structural grading and fabrication for use in the new building. To optimize the use of the available size the engineer suggested the use of composite design for the floor system.” Whatever else you think of the building this super reuse of timber is quite a feat. Rural Studio have been working with reused, reclaimed and found materials in the Southern US state of Alabama for several decades. 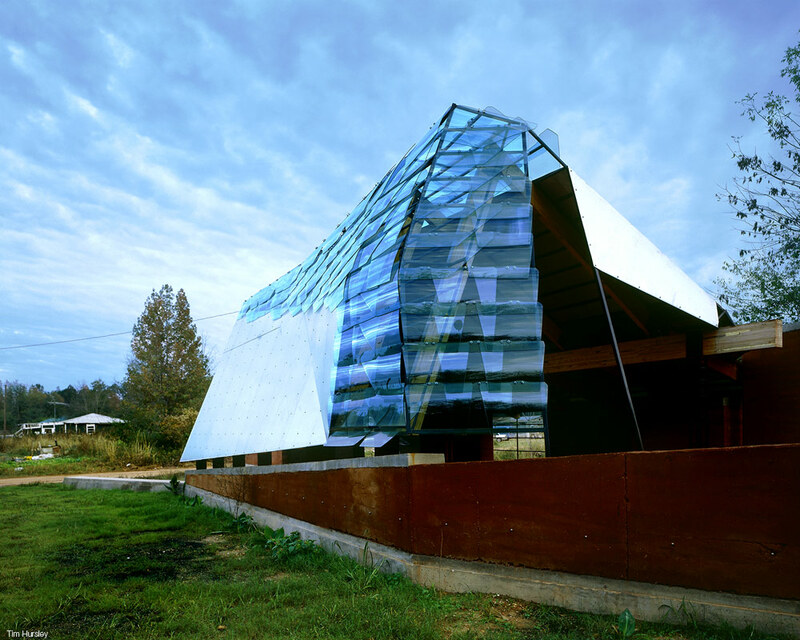 Arguably their most iconic, reuse project is Mason’s Bend Chapel where car window screens make the perfect façade foil for this glass cathedral of the dispossessed. 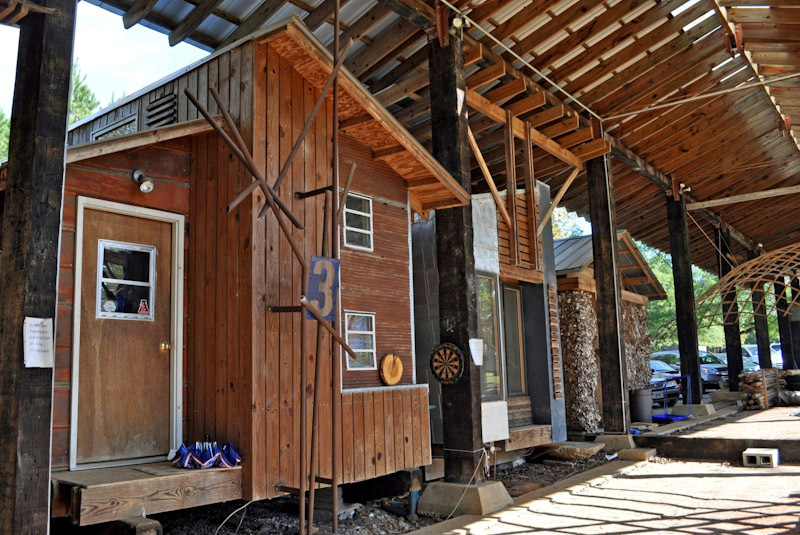 Check the rest of Rural Studio’s site for many other examples, old and new, of how architecture can make sublime virtues out of the art of reuse necessity. BioRegional, the social entrepreneurs behind BedZED and One Planet Living (including OneBrighton), have been one of the most active in initiatives to get Building Material Reuse Centre’s established. Their collaboration with Arc-Croydon conducted a nine month research programme called Re:BUILD, attempting to set up a building material reuse centre in Croydon. A Case Study can be downloaded here. An investigation into the viability of Building Materials Reuse Centres – MSC by Andrew Edwards, Oxford Brookes University 2011 here. The Atmos Project is Transition Town Totnes, (Transition Town Central – UK department) flagship project, an old Dairy Crest factory which TTT are working on turning into a ground-breaking eco-hub, including local businesses, affordable housing, a food entrepreneurs school, and a Building Materials Reuse Centre. Stone, earth for cob, green timber, sheep wool and straw bales, can all be found from within the five miles of Totnes. If the Cornish Peninsula is included these local natural materials can be expanded to include more highly processed natural materials and a wider palette, including recycled cellulose insulation and processed sheeps wool. Only steel and imported softwood would need to come from further afield. Seattle, Oregons’ Rebuilding Center, the largest by volume used materials centre in North America, is nearly 20 years old. The Centre contains a veritable treasure trove of all and every kind of used materials needed to build a home, from door-knobs to baths to the full scale steel joists. Dedicated teams of Deconstructionists head out daily to dismantle, collect and retrieve materials from the city and it’s surroundings. Known as the DeConstruction Services these trained specialists dismantle anything from “a kitchen, to a full house, to a 100 year old grain mill.” Working by hand, this demolition by other means results in up to 85% of materials being reused. Here’s one of the founders telling Rebuilding Center’s story. The ReBuilding Center also includes the ReFind furniture workshop, which produce bespoke furniture and designs, including this recent local Portland yoga studio reception desk. The ReBuilding Center’s Centre is designed by Communitecture. 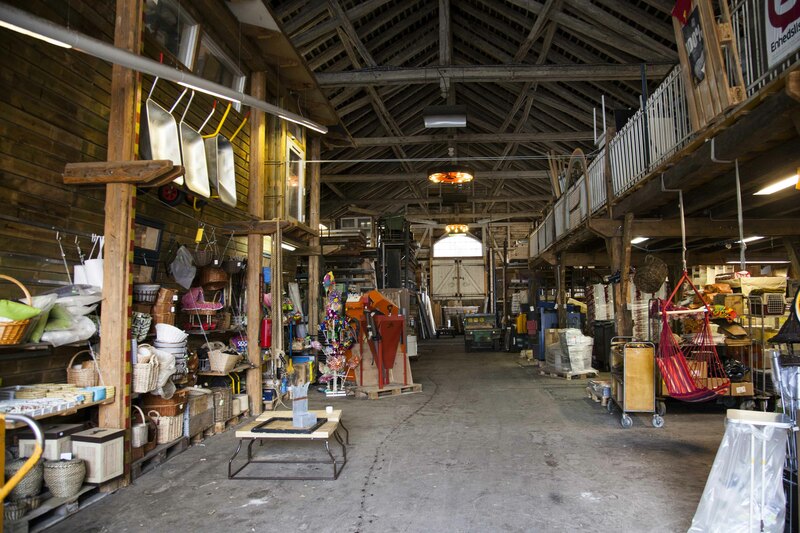 In Britain Reuse It Yourself has been set up as a platform for developing a nationwide network of building material reuse centres, aiming to emulate Habitat for Humanity’s ReStores network. Based on the principles of the National Wood Recycling Centres and Furniture reuse projects, ReIY centres act as hubs to co-locate different enterprises and include training. These are social enterprises, which collect excess construction materials and sell them on. ReIY note that Building Material Reuse Centre’s need space to work. A site of 10-20,000 sqft is needed to do a BMRC justice, smaller sites will only allow a limited product range to be undertaken. The network of centres has been around longer and are more widespread and developed in North America than in Europe. The mainstreaming of the centres was started by Habitat for Humanity the US building NGO charity, with their independently owned ReStores, not for profit home improvement stores and donation centres, across North America. There are now 700 plus across the continent.